The Tile Cutting journal. Paul's Tile Cutting Journal. Jerry rigging engineering at it's best. Please don't try this at home, kids! 2/21/00 Start of tile cutting journal. My goal is to build a tile cutting system that can cut 25,000 tiles an hour. 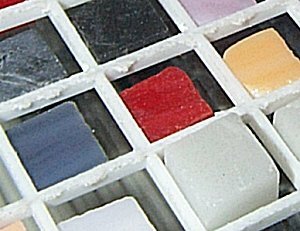 The tiles I want to cut would be made out of ceramic, marble, granite, and any other materials that would work to make mosaics. They will be very small at 1 CM SQ. At first I just want to build a manual cutting system so I can start selling the tiles, and building my image database of these tiles. A friend of mine is currently writing a mosaic tile matching program. It's already matching tiles pretty good! 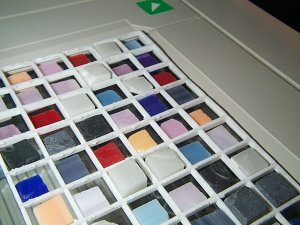 After a while I want to start warehousing these tiles, and have a computerized pick and place machine build the mosaics. If you did not know, there are plenty of free ceramic tiles to go around. At tile stores they buy tile in pallets, in dye lots. Any stock from the dye lot under 3 sq. meters that does not sell, will in many cases find it's way into the dumpster. I have had tile store owners tell me that they have filled dumpsters with new boxes of tile. Under 3 sq. meters there is very limited use for it, that's a small room to tile. Unfortunately a lot of that stuff is whites and lighter browns, being the popular tile colors. A white and brown mosaic just is missing something. But if you look around you can get enough leftovers, samples, breakage, and cut-offs quickly to fill their color palette. Another sure fire endless free source of marble and granite in thicker sizes 2-3 CM is counter top shops. I seen a huge loading dock that contained all marble and granite scrap. I have not looked hard enough myself, my I am hoping to find a large source of marble and granite tile, the 1 CM thick size. One problem is that some of it will stay at the house or building after the job, to match for future repairs. That said, I did have a tile guy email me. He said: " HI, I read your story, it is very interesting. I happen to be a tile installer. If you would like some really nice tile, check out the installers in your area, and find the ones that do custom homes. I throw away all my left over pieces, so I am sure they do to." I plan on using the above sources and more. One can find boulders to cut up that will look great when cut into 1 CM SQ. tile and tumble polished. There are many sources for semi-precious stones. I also plan on making my own composite stones. Lapis lazuli, and opal are two popular stones for this. At first I want to manually saw the tiles, then when I am confident with that, I will drop stepper or server motors to control the saws automatically. I have skills all over the place, machining, robotics, and programming. What you are going to see here is real life. That would include dunce-like mistakes, bad foresight, failures, and hopefully at last success. At first, I am going try and not spend very much money, so I am going to have to do some, jerry rigging! I am not sure who this Jerry guy is but, he sure had a bad name. I have never cut glass, ceramic, or rock, this should be fun. I was a machinist for 5 years, it can't be much different. Bronze and cast iron are really crumbly when they cut, maybe cutting stone is like this? One comment on safety, before you contact McHenry County Sheriffs Police, and try to have them charge me with reckless conduct, using this journal as documented proof, I would like to say a something a few things. Many people do lose fingers, eyesight, and yes their hearing over time working in the shop. It really can happen to you. While in the US Navy, at least three or four times I have seen guys come back from getting there hearing checked, and they had a 10% - 20% drop in hearing because they were not wearing ear plugs in the shop. They were told many, many, times, but they just did not listen, we had proof that they could here us:-). You have to use common sense when working with these machines, they will bite! If you are hesitant, just don't do it! I won't swing 250 KG parts around in machines any more, it's just not worth it. When something comes loose the machine will win! 2/22/00 Skill Saw with touch of X-Y table. What I did here was bolt an X-Y table to the table of a drill press. I bolted a skill saw to the X-Y table. Then I clamped down a vise to the drill press table. I put a diamond blade in the skill saw. I even put a 20 liter bucket of coolant at a higher level, with a hose running to the blade. This is rather dangerous because of shock hazard! It worked. I put a 7 cm diameter rock out of the driveway into the vise, turned the X handle to position the blade in front of the rock, then end would turn the X handle to cut the rock. I would move cm closer to the rock with the Y feed, and take another slice. I cut marble, granite, and tile. I even tried a hunk of copper. It thought about it for a while before it cut it. Not remembered. In fact, this setup is not recommended! It does slice though. Well you better get out the ear plugs for this one. I heard you can cut 3/4" granite sheet with a table saw and a diamond blade. There is just seems something wrong about doing it though. So I tried it, the 3/4" sheet cuts slow. 3/8" thick marble and granite tiles cut OK. With the garage closed up, oh the dust is nasty. I always though it would be cool to have a shop right on the beach. You could be cutting away on your machines while the waves are lapping away at your ankles. You could be working on you tan, while projects progress. I guess this is shaping up to sound like a beer commercial. While I am against imbibing alcoholic beverages while running hazardous equipment, I have consulted high counsel, and they have told me about some other hazards. I was told it just would not be safe to have your fingers near the table saw blade, with all kinds of good looking half naked woman walking around. Anyway, the saltwater would not be the best for the preservation of the machines. And, at last, there would be a little bit of a shock hazard. Now I tried to convince the high console that one could make stainless or better yet carbon fiber machines that are powered by pneumatic motors, but they still were not convinced. I was experiencing way too much dust coming of off the dry cutting blade, so I have decided to add coolant to the table saw. I did a few cuts, then my sanity came back to me, after I seen the water splashing up upon the motor. I once had to drill holes under water, in a flooded bilge, on a ship, air powered drills come in handy the day! I bet there are people who cut rock on a table saw on a regular basis. It's not for me. 3/1/00 The many uses of sewer pipe. I happen to have a few lengths of 4" (10CM) waste and drain, plastic PVC pipe left over from a successful Hydroponics Project. I put the tiles in plaster in this pipe to cut them. It worked good. 3/2/00 What the heck is breaking the tiles? I made my first cross cuts today. That is I actually cut the 1 CM strips of glass into 1 CM squares. I guess I use the word square optimistically. When I got done, there were a lot of parallelograms, and broken tiles. 3/8/00 A look at a horizontal mill. Today I went to The National Industrial Automation Show and Conference at McCormick Place, Chicago, IL. Very interesting for those of you who have never to been to a design and automation show. They have everything that you need to build and design computerized equipment in a factory, expect the machine tools. All the big machines will be at the International Manufacturing Technology Show 2000 September 6-13, that's at the McCormick Place as well. The Design show is yearly but the tool show is on even years. I went to IMTS, the machine show, in 1996, oh boy it's like one of the biggest shows in the world. A Billion dollars of sales is conducted on the show floor, yes folks that's a B for billion, that's like 1/4 of the GDP of the Bahamas. But that's not the show I when to today. I am easily side tracked, so anyway about this design show; I talk to these companies that have all these great products that I can't afford right now. We get to talking about my use of the product, whether it is a motor, slide, a control, software, or anything that applies to tile cutting and scanning machines. So we get to talking, and it seems like I am always asked if I want an engineer to contact me about designing a system, using their parts of course, for my needs. Now this is interesting. They get very persistent about it, it is almost like they just want to set another appointment, and they are not listening to me. First I tell them that I have no money in my business budget to buy what they are selling. Of course that does not stop them, "are you sure you don't want an engineer to come by?" Then I tell them I am independent, duct taping together surplus parts in my garage to make these machines. Still they are persistent. So I tell them I am cutting rocks with a Skill saw. Now after told them this much, do they still think they are going to make a sale on my company? I walk away just plane refusing them, which I am beginning to think is a mistake. So here is my dilemma, I really do want opinions from these guys, should I have them design a solution for me? Who knows, maybe they are that good that they will make money off my company some day. So if you work for a large company and want to design a solution for me, after reading this, and know that I don't have much of anything to spend, please contact me. I will publish the solution, and hopefully get your company some other business. Maybe I will spend a little money. And yes, I would love to get corporate sponsorship, I will use the free stuff, but of course we all would like to get free stuff! 3/16/00 New Supplies: motor, blades, X-Y table, pulleys, pillows blocks, and true grit. Today a good friend of mine, Adam Nelson asked for a scanned image of the tiles. He and Greg Stallard are writing a picking program, to pick the tiles for placement into a mosaic. There are many, many improvements that can be done in the process before this scan is done, but just to prove concept it has to be done. This is the tiles in scanner Here is a close-up of that. Notice my thickness varies a lot. What I had done so far were 200 - 300 stain glass, and black and white marble tiles. 1. The grid needs to be deburred better. The white plastic 12 MM grid is for ceiling panels. It comes in a 2 by 4 foot (.61 by 1.22 meter) sizes. Since the stain glass is 3 MM thick I had to cut the 10 MM thick plastic grid thinner, because it makes it easier to load the tiles in the grid. Otherwise they sit on top of each other and on end. 2. The grid warps a little. The tiles will fall underneath if you don't hold it right. 3. The grid needs to be wider. It's only 9 centimeters wide right now, it could be 20 CM wide. The problem is I can cut only 9 CM's thick on my band saw. Anyone know how to make this stuff thinner? I tried a trim router with a 7mm bit. It took too long and kind of melted it. I tried a fly cutter, it destroyed the grid. That, and I was worried about my fingers. Maybe it would have been fine at like 4000 RPM, but that is suicide. I thought about putting it into the planner, but I think that would have shred it to bits! 4. The tiles are breaking because the blade is too thick, I am using hand feed, it should be motorized and slower, and it is pressuring the cut, because it's cutting on a taper. I think I do have enough coolant. 5. The saw needs to be dialed in so that there is no taper in the cut. This causes the funky angles and widths. I would really like to have tiles that are 1 CM square plus or minus .4 MM. I think that would make an acceptable commercial product. 6. The tiles are of different thickness. It would be easier to place them in the grid if they were all the same. Production will be different. 7. They need to be tumble polished. They would look a whole lot nicer and have a somewhat rounder corners. 8. They are different sizes. The marble and granite 25 CM SQ. tiles I have are 1.03 CM thick. I am not sure if they are trying to be 1CM think or not. I also was cutting tiles 3/8 of an inch SQ., I am quitting that. This grid is 6 by 24, which results in a rather gross number of tiles. I went tile store hopping today, not much luck, I did pick up a few pieces of 2-3 CM thick granite out of a dumpster. I am beginning to hear the same story. "We just toss the stuff, before it gets in the way". One store told me they have a crusher, that they toss the 1 CM thick stuff into on a regular basis. I am thinking about starting a campaign to safe the tile. Of course then again if I start going though mass qualities of tile, it will be 100 times more convenient to just order the sizes and colors I need. We will see. One other point of interest, one store had onyx tile. That is a little harder cut then granite, I think. It is a type of chalcedony, jasper and agate are related. Of course there are companies selling semi-precious tile, ADC Dommel and Lapidare being two of them that I know of.